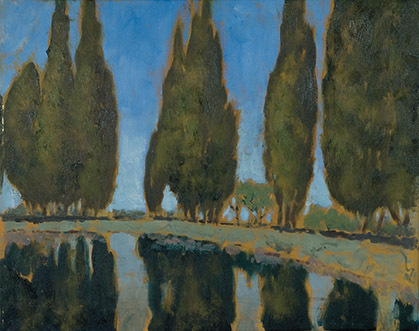 A few years ago, as painter Adam Van Doren worked on a monograph of his work, he invited his friend, poet and Bates professor John Tagliabue, to write a single poem to accompany Van Doren’s paintings of Italy, where Tagliabue was born in 1923. Tagliabue’s response? Forty-eighty poems. 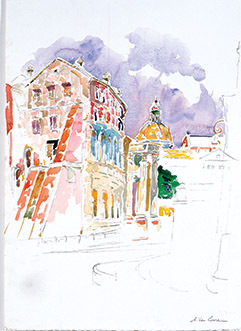 For information on ordering An Artist in Rome, send a note of inquiry to Bates Magazine. Tagliabue’s poems did not arrive in time for that 2007 monograph, so Adam Van Doren, with pleasing results, has decided to feature the verse in his new book, An Artist in Rome, recently published by Kelly-Winterton Press. angels saying and sounding off with their trophies and trumpets? for teaching me the untranslatable vows, for teaching me to bow.